This website will chronicle the life and religious views of singer Beyoncé Knowles. 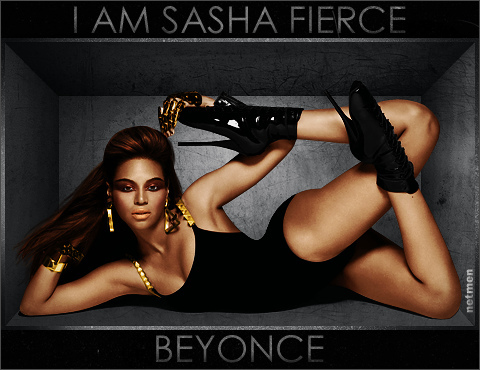 It will focus primarily on her controversial alter ego named Sasha Fierce. I examine how this ego created not only a symbolic rebirth for the singer but also a symbolic death. I will talk about the religious controversy that Catholics have towards the singers’ alter ego. Lastly, I will examine imagery between Knowles' good and evil personalities. In order to prove these themes and arguments I will use Beyoncé’s music videos, interviews and pictures as examples. The first focus will be a short biography. It will explore Beyoncé`s life from her Catholic upbringing to her beginnings in the music industry; from the all-girl group Destiny`s Child to a successful solo career. It will examine her personal life including her marriage and baby daughter. There will also be a subsection that will show Beyoncé's full music Discography. Next the site will look at who Sasha Fierce is and how this alter ego was born in the making of her music video “Crazy in Love”. It will also state why religious spectators believe this alter ego is considered to be evil. In addition to that, the site will discuss spirituality and channeling a spirit. Spirituality is one of the main themes that religious spectators debated against Beyoncés' alter ego, these arguments will be illustrated through interviews as well as a music clip. I will also describe what it means to channel a spirit and how it is conveyed through Sasha Fierce. Finally, I will examine how this ego is considered to be demon like. During her promotional performances and photographs for the album I am… Sasha Fierce, Beyoncé wears many symbolic articles of clothing that represent Satan. I will use these photographs to showcase and highlight the Satan features. I will use the I Am...Sasha Fierce album to examine how Beyoncé is considered to be god-like while Sasha is considered to be a demon. Lastly there will be a subsection which will use several of Beyoncé's famous music videos to help further show the good and evil sides of her personality. Overall Beyoncé has had an enormous impact on the entertainment business since the beginning of Destiny's Child. She is known to be one of the best artists of the 21st century; due to her creative music and visionary eye she has set the bar extremely high for new artists. Even though her creative vision may be hard for religious spectators to understand, she will continue to believe in her religion and push boundaries.